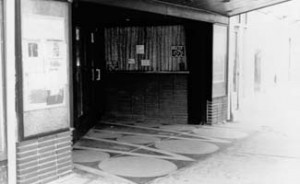 The original theater room before the splits in 1990 and 1995. Image from New 400 Website. As the 1920s ended and the Great Depression took hold, entertainment businesses sought to provide more value for customers while lifting the spirits of a frustrated populace. In 1930, the theater changed its name to the 400 Theater; “The 400” was a then-common term referencing the most affluent members of society – similar to the phrase “Fortune 500” today. The idea likely was to stroke the egos of patrons, though the drop in admission prices (matinees went from 35 cents to 15 cents) was surely more appreciated. The theater also added air conditioning in 1933 and held Saturday matinee parties for children, complete with “400” Brownie Ice Cream. 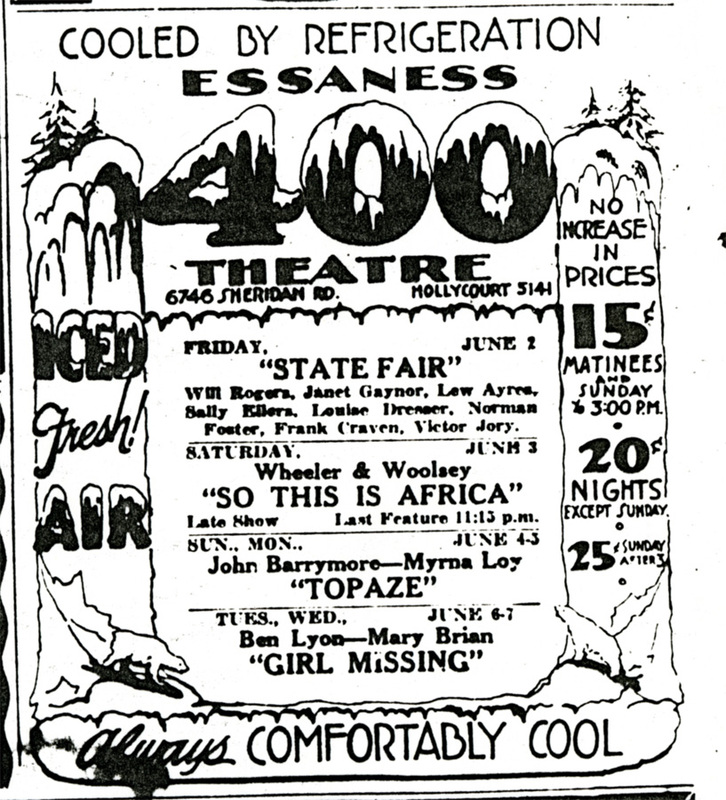 Then ran by the Essaness Theatre Company, the theater advertised its new A/C with the words “Always Comfortably Cool”, “Iced Fresh Air!”, and, most importantly, “No Increase in Prices.” A paucity of available records makes identifying owners difficult, but sources indicate that the Rail Theater Corporation ran the theater next from 1937 to 1945 at least. 1933 Newspaper Ad. Image courtesy of Theatre Historical Society of America. As televisions grew in popularity, theater owners worried that patrons would abandon the silver screen for the cost and convenience of the tube at home. Theater attendance by television owners had indeed dropped by more than half in 1948, and theaters felt the pinch as more consumers bought sets over the next decades. The 400 continued to adapt to remain competitive. In 1955 the theater installed the new Cinemascope projectors, introducing Widescreen ratio films to its patrons. It also continued to serve as a location for community events, including theater parties in 1957 and 1958 to fundraise for local polio and cancer research clubs and the Gale Elementary PTA. By the 1960s, older one-screen theaters like the 400 faced new competition in the multi-screen megaplexes opening up, which could offer more movies in fresher structures. Some of the dozen or so Rogers Park theaters built in the 1920s re-tooled for other uses, such as the Mayne Stage on 1328 W. Morse Avenue (also built by Grossman & Proskauer) which operated as a synagogue, shoe repair store, and now a restaurant and live theater/music venue. Other Rogers Park cinemas, including the once ornate Adelphi and Granada theaters, were demolished for good. The 400 survived the 1970s and 1980s by changing its role to capture a different audience. Instead of showing first-run films at full price, the 400 became a second-run venue, offering cheap admission to family films as well as cult classics like Blade Runner and the Rocky Horror Picture show. The theater’s proximity to Loyola University helped draw in the student crowd needing an affordable date destination. Edgewater native Jim Burrows oversaw the 400’s switch to second-run films, owning and managing the theater from 1973 to 1987. He and his wife, Jane, ran the whole show from booking and cashiering to ushering and cleaning – a complete “mom and pop” operation. Burrows complained regularly – including in a few Tribune features – about how difficult it was to stay in the black selling $2 tickets ($1 for children). While the 400 picked up customers who could not afford full price at a fancy, modern multiplex, Burrows also had to deal with film reels heavily worn from hundreds of showings, and patrons often complained about the aging building’s obsolete sound system and fickle air-conditioning system. He elected not to show action films (as he felt they cause hooliganism in his late-night, often drunk crowds) and he refused to admit children under six unless a Disney movie were showing. Theater exterior, fall 1986. Image from New 400 website. The box office before it was moved inside. Image from New 400 website. 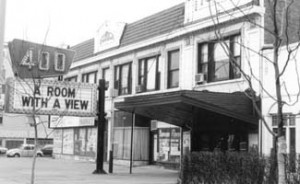 In 1987 Burrows lost the lease on the theater (which he personally announced to patrons after a showing of James Ivory’s “Room with a View”). 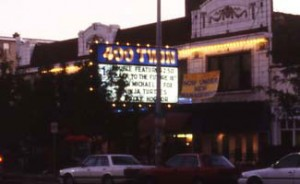 Purchased by Evanston company Village Entertainment, the 400 briefly changed its name to the 400 Twin in 1990 when the new (and extremely controversial) manager Ron Rooding finally split the storied theater into two screens. The building’s 1912 construction facilitated the upgrade better than most older theaters would have since its original viewing room was wide and comparatively shallow, not long and narrow. The exterior box office was brought inside a new wall, but the terra-cotta façade remained. The 400 Twin also kept its love seats (gone today), the last metropolitan theater with that sickly sweet feature. Shortly after the renovations the name again changed, this time to Village North Theater. Rooding spent $1.3 million renovating the property and added a small restaurant, the Atomic Café; he even orchestrated a (failed) referendum to allow liquor sales in the 49th Ward’s 9th precinct so he could sell cocktails. 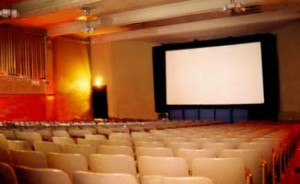 In 1995, the rooms were split again into the four screens the theater has today. The Village North Theater continued hosting community events, such as a free children’s cartoon festival in 1990, and again adapted to meet the challenges of the 1980s and 1990s. Theater exterior c. 1990. Image courtesy of Theatre Historical Society of America. Ron Rooding was a weird character, to say the least. In 1989, a Chicago district judge had to issue a restraining order for Warner Brothers to prevent Rooding from parachuting onto North Avenue Beach dressed as Batman – and the Village North Theater was not even showing the Tim Burton film. Rooding feuded with Alderman Joe Moore over the liquor issue and a proposed multiplex at Howard and Paulina. (Well, Rooding feuded. Moore denied any antipathy on his part towards the possibly paranoid entrepreneur.) And Rooding had beef with Rocky Horror troupes at multiple theaters he managed, so much so that eventually he just ran the racy film without the iconic live element. He did, for all his faults, creatively keep the projectors running at a low-budget second-run theater while similar antique venues were being closed and demolished all over Chicago. But by 2008 the general local consensus was that Rooding had ran the decaying theater into the ground, leaving it with dinghy walls, poor sound quality, and even crappier air conditioning. Loyola students called it “The Ghettoplex.” In 2008, Village Entertainment folded and Rooding was gone. Another company, Vision Entertainment, purchased the Village North Theater and renamed it Visionary Theatre, but by January 2009 Village Entertainment had also fallen apart. For a few months it appeared that the broken-down theater would go the way of so many of its peers: demolished or converted into stores. But in July 2009, the theater reopened under the ownership of Evanston-based ADF Capital and its president, developer Tony Fox. A $700,000 facelift replaced the decrepit carpet, curtains, screens and some of the seats, and brought in new A/C and sound equipment. Trying to capture the venue’s history while highlighting improvements, Fox renamed the business the New 400 Theaters, where, according to the theater’s website, the aim is “ to keep every customer’s experience a positive one so that they can feel they too are part of the “New Four Hundred.”” The screens again show first-run films (although still at ticket prices far below those of the city’s downtown or suburban megaplexes). Most importantly, the new management continues the tradition of community involvement. They host events in conjunction with the local alderman’s office and donate to area schools. The New 400 also shows classic holiday films for free around Halloween and Christmas, and often kicks off popular releases with viewing parties, complete with raffles, trivia, and movie-themed cocktails from its full (now legal) bar. Rogers Park residents know that the New 400 is the best place to see a movie if they want to avoid leaving the area or paying double digits on a ticket, making it an excellent choice for locals and especially Loyola students. But few in Rogers Park realize that the city’s oldest movie theater sits unassumingly in their neighborhood. By adapting to fit economic niches and constantly engaging with the community, the theater has managed to survive, telling celluloid stories for 103 years. Hopefully the New 400 will continue the tradition long into the future. For notes on sources for this article, please contact Matthew Amyx at mamyx@luc.edu. For more information on the New 400 Theaters please visit http://www.thenew400.com. Special thanks to Stephanie Barto at the Rogers Park/West Ridge Historical Society, Patrick Seymour at the Theatre Historical Society of America, and Christian Gray at the New 400 Theater. Any errors are solely on my part. Matt, great post! I really enjoyed reading more about the 400! My parents lived in Edgewater during the late 1970s and early 1980s, and whenever I mention the 400, they automatically start reminiscing. I look forward to sharing your post with them! The 400 Theatre never got “twinned”. Rooding had told people in the late 1980s that he was going to twin the auditorium but it never happened. I saw THE CROW at the 400 in 1994 and it was still a single-screen theatre. The 400 got quaded in late 1995 and it was re-named the Village North Theatres.